What cables were entrusted at the 2015 New York Audio Show to showcase MartinLogan's flagship 75"-tall, 385lb Neolith loudspeaker ($79,995/pair), Rogue Audio's world class Apollo Dark monoblock amps ($14,995/pair) and other Rogue components? You guessed it. Darwin Cables. Pictured right, is Darwin co-founder Bill Magerman, in the room featured in show coverage by Stereophile. Veteran reviewer Art Dudley raved that the sound was "tight, powerful, and resplendent with detail without seeming bright." The consensus was that the $150,000 system was the star of the show. Darwin debuted Darwin Truth II Black Speaker Cables ($2,995 2M), built specifically with the demands of the Martin Logan Neoliths in mind. But make no mistake these Truth II speaker cables, with a configuration of silver strands in air-dielectric, will deliver an extraordinarily rich palette of textures with any speaker. Also, the beefy Rogue Apollo Dark mono blocks were energized by Darwin’s formidible 10 gauge pure silver Truth II power cables ($1,295 1.5M). Interconnects were all Darwin Truth II cables ($1,095 1M). 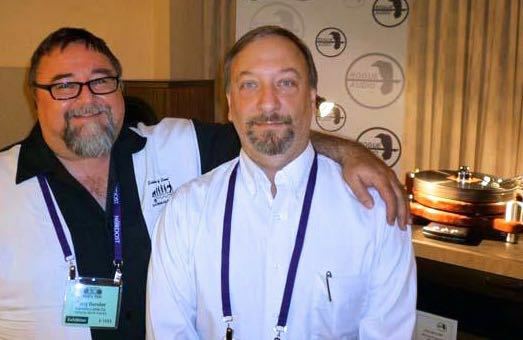 Left Photo: Darwin Cable Company co-founders, Tony Bender, left and Bill Magerman, right, pictured at Rocky Mountain Audio Fest, 2013, in Denver. 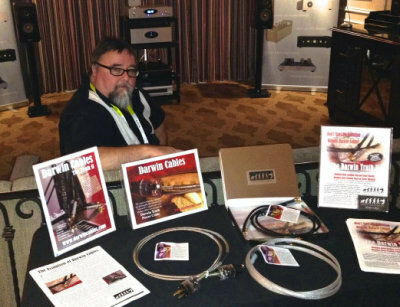 Right: Darwin Cables were featured at CES in Las Vegas in January 2015. Some of the names that trust us to cable their gear at major shows, when everything is on the line, include: Rogue Audio, Martin-Logan, Tyler Acoustics, George Warren Turntables and Joseph Speakers. The very fact that you are reading this is evidence that you are one of the rare individuals who is so passionate about music, hearing it in the best way possible has become a quest and quite possibly an obsession. That would describe Darwin Cable Company founders, Bill Magerman and Tony Bender. Each independently discovered the potential for great musical reproduction in their college years. It was an obsession for excellence limited by financial realities for many years. 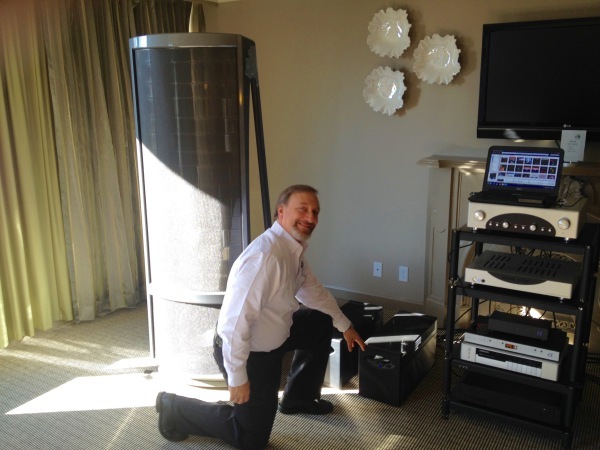 Bill's love for music lead to his founding of Tribute Audio, a company that catered to Epicure speaker aficionados. Bill's exceptional crossover reproduction enhanced the legendary speakers, and in the process created a cottage industry. His customers urged him to create cables as good as his crossovers—which he did, never imagining where it would one day lead. A disciple and now a guru of low-mass design, Bill's cables reflected his experience and reverence for the capabilities of solid core silver wire. Using materials at hand, the wires were incased in clear packing tape, with low mass RCA terminations. Despite the DIY appearance, the cables outperformed thousand dollar cables. That's where Tony Bender comes in. A former D.J., music historian, promoter, producer and businessman, Bender, whose finances had finally begun to approach his tastes, nonetheless found himself put off by the hype, deception and high prices in the cable industry. Through connections in the audio industry, Bender had access to cables costing tens of thousands, was impressed by some of them, but never satisfied with the performance—let alone the obnoxiously high prices. A mutual acquaintance tipped off Bender to Magerman's Tribute Audio IC's, so Bender, in his never-ending quest for performance and value, ordered a pair. They weren't much to look at and far too fragile, but the performance was otherworldly, and bumped Bender's big dollar cables right out of his system. “It was clear to me that this was a diamond in the rough,” Bender said. That philosophy led to the air dielectric floating silver wire design you see today. The silver wire makes minimal contact with teflon, resulting in a spectacularly efficient, low capacitance cable. Other refinements followed. Different gauges of wire and tubing were evaluated. 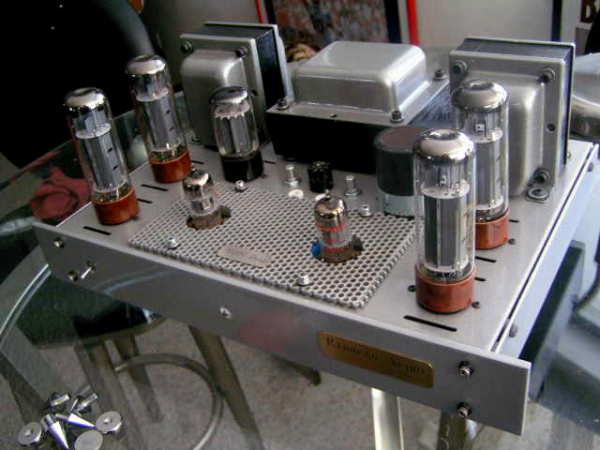 They tested many RCA terminations, including some of the biggest, most expensive names in the business, before discovering the perfect termination for their unique application. Once they had refined the formula, and Bill had incorporated time-consuming but effective build techniques, they cryogenically treated their cables at the world's leading facilities. The process lowered the noise floor for even more spectacular performance. Bender is a collector of fossils. They are used them as backdrops for cable photo sessions. Both men are involved in theory, conception and design, but Bill is the superior craftsman who brings each prototype to life. Tony—the ears of the company—is the initial analyst. “When the performance moves me emotionally, that is when I know we have something special.” At that point, the cable is sent out for blind evaluations through the company network. “It's not a great cable until everyone says it's a great cable,” Bill said. More than one customer believes they are the best at any price. • Low Mass Ends: Lead developer Bill Magerman has long described heavy, bulky ends as “audio jewelry.” All flash and no substance. Heavy ends create unwanted signal anomalies and eddy currents, smearing the sound. We build cables for your ears, not baubles for your eyes. By painstakingly testing many, many ends by ear, including some very well known expensive brands, we found the best combination of low mass, quality metallurgy and synchronicity with the unique design. Under a microscope, we look for a smooth finish—no gaps or pits—for superior connectivity. All RCA ends are reengineered for dielectric superiority in a build process taking as long as two hours, creating what we truly believe to be the finest connectors on the planet. Our low mass cables weigh just ounces. They are built for pure performance. • Silver Core Wire: Darwin sources the finest silver wire from three continents. Seemingly infinitesimal variances in gauge, purity and quality can make a huge sonic difference. Our silver is 7% more conductive than copper. Audiophiles know how difficult it is to achieve those final increments of excellence. Why would you start 7% behind? A myth about silver is that it is “bright”. That is simply a reflection of a poor build. (And we'll get to that below.) High quality solid core silver, properly isolated, is the key to great sound. Silver-coated copper is harsh and etched; stranded wires are smeared and inarticulate. Darwin Cables are organic, natural, balanced, with impeccable pace and timing. No listener fatigue ever! • Cryogenics: Hours long, computer controlled cryogenic treatment—enhances molecular structure, in the way ice forms on a pond. It lowers noise floor for better dynamics and laser accuracy. Darwin's most advanced cryogenic process which replicates the cold of deep space, CryoWise ©, is used in the company's flagship Truth Cables. The effect of the CryoWise © process, revealed more fullness from recordings than anyone knew was there except for, perhaps, the musicians in the studio when it was recorded. Darwin Cable Company relies on an industry leading laboratory that meets military specifications. It's a very expensive extra step, but we just cannot stand the thought of building a cable that isn't as good as we can make it. • Air Dielectric: By floating the wire in an oversized teflon-like tube, with minimal contact, Darwin Cable Company virtually eliminates the veiling that is introduced with coated wires. Anything that touches the wire diminishes the sound. Even quality dielectric in close proximity to the wire will diminish performance. • Two Stage Contact Enhancement: We use two stage contact enhancement process. The most important aspect is the quality of the terminations themselves, which we examined under a microscope and then tested by ear. Cumulatively, it does make a difference. • Low Capacitance: Coated wires and bad dielectric anywhere in the cable, including common nylon sleeves, veil the sound and raises capacitance. All that “junk” become part of the signal path and raises capacitance. If there is something cable manufacturers can agree upon, it is the significance of capacitance. The higher the capacitance, the more energy that is stored and released in an unpredictable, unscheduled manner. The result is a confused, ill-timed signal that your brain recognizes and instinctively tunes out. To arrive at the Darwin build, we voiced every element from conductor to (silver) solder to the sound of various tube thicknesses. We trusted our ears, and later, when we subjected the cables to scientific measurement, we recorded the lowest capacitance numbers in the industry, which validated what our ears were hearing. The Truth II measures an astoniching 7.20 pF/ft. • Skin Effect: Because high frequencies naturally gravitate to the outer edge of the conductor, they commonly arrive slightly too early, creating an unnatural brightness that can be impressive in the short term. But the brain understands something is unnatural and soon rejects it through what is known in the industry as listener fatigue. Most cables suffer from this malady. Counterintuitively, smaller gauges can create bigger, more perfectly timed sound, and eliminate skin effect. Just how far you can push the envelope for otherworldly performance depends upon the precise application of gauge in relation to length. Push too far and go too thin, and phase issues may arise. Silver's superior conductivity is a key to extending performace. Darwin has achieved the perfect balance through a Thomas Edison-style process of elimination. Tweak. Listen. Tweak again. Listen some more. It requires patience, but we learn something every time. From an analytical standpoint we know when something is missing or when something new is revealed even on a micro-level. It's as much art as it is science. We know things are right when we are moved emotionally by the music. Judging from the rave reviews of professionals and customers alike, we got it right. • Neutrality/Transparancy/Accuracy: Allow us to shatter yet another urban myth, that the performance of cables is “system dependant.” Not so with Darwin Cables, for a simple reason. Our cables are meticulously voiced for precision, neutrality and transparency. Professional reviewers and owners have been stymied trying to assign a “sound” to our cables. The Darwin is not a tone control cable. There are some brilliant component builders out there and some amazing musicians, recording engineers and producers. We are not going to presume to “fix” anything. 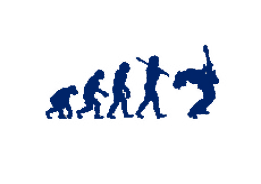 Our goal is to get the heck out of the way and let them work. Too often people end up buying one expensive cable to try to forgive the sins of another. The industry has completely lost sight of the purist school of thought. Simple is almost always better. A pristine connection allows you to hear the quality of the gear and the musicians. Darwin Cables are voiced with a series of key “torture” test tracks to analyze inner detail, attack, decay, bass, treble and midrange response and clarity. 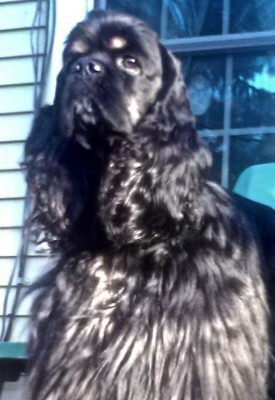 When we were searching for a name for our company, a friend kiddingly threw out the name of one of his world class cocker spaniels, Darwin. We loved the name because it reflected our restless quest to make our cables better—you know, Darwin's Theory of Evolution. We love the name and we really love that goofball Darwin. He's one awesome dog. Located in same dedicated music room. The primary purpose of this system is to test balanced cables although RCA cables are tested here as well, and It is also a secondary test system for power cables and speaker cables. By nature it is a warmer more boisterous system, which lets us analyze the ability of our cables’ detail to cut through the warmth. Again, in the same room. Strictly a desktop/Headphone system, yet it defines just how much quality cables, from the wall to the speaker, can impact the overall performance of even a modestly-priced system. An old-school system. A timeless Dynamo ST70, rebuilt by the inimitable Will Vincent. At the other end are single driver Cain & Cain Abbys. Very revealing and a good test of soundstage in an intimate listening area. Darwin Cables are analyzed and voiced on a variety of components but primarily on these systems. This is the system that does most of the RCA cable analysis. The whole system is dedicated to precision and neutrality. From turntable to tape to CD to FLAC playback, we can analyze performance here. Power cords and speaker cables are tested here. Located in a converted two-stall garage, it has been expertly tuned with absorption and defraction panels. During the tuning process, we got it laser-accurate—too perfect, in fact—so we removed a couple of panels to add just the right amount realism and life. A very very resolving system. We can usually get a very good idea in the first few minutes about the potential of the cable. Although we have two Hagerman Cable cookers, we prefer to let nature take its course so we can better understand the mercurial nature of the break-in process. • Dedicated fusebox and power lines. • Audio Elegance Rack with various, maple blocks, brass cones etc.